I’ve had Science Journal app on my phone (Android) for some time now, and every so often, I pull it out to play with it. But last night, as my new/old band began to play for the first time in over a year with a PA system and guitar amps (long story short: we lost our singer and bass player and practice space, went acoustic, found new practice space, looking for singer and bass player), I wondered what the sound levels were. 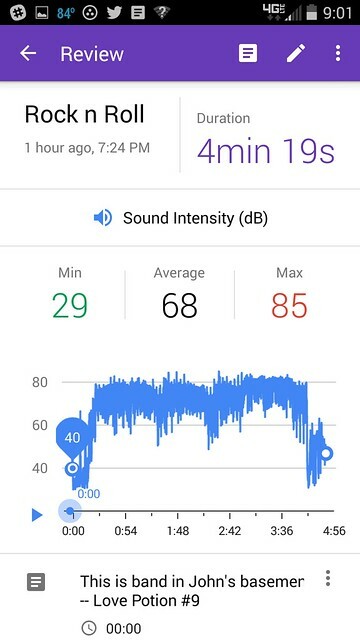 Right before we started our first song of the night in our new practice space — Love Potion Number 9 — I put the Science Journal app into motion, capturing and recording the decibel levels in the room. Yeah, it was loud. Our drummer has been waiting a long time to pound on his skins (as opposed to the electronic drums he has been using). He pounded away. But it was neat to see the spikes of the song in Science Journal later on. I could see where the solos were, and where the song dipped into the break part, and more. I could see where the decibels clipped maybe a bit too high. It made me wonder about that 85 db range that we hit. So I tracked down this chart. No wonder our lead guitar player wears special “in ear” plugs. We hit 737 sounds! Science Journal is part of Google’s Making & Science initiative, which is pretty cool to check out. You can read more about Science Journal (it even connects to Arduino? Cool) with this article. 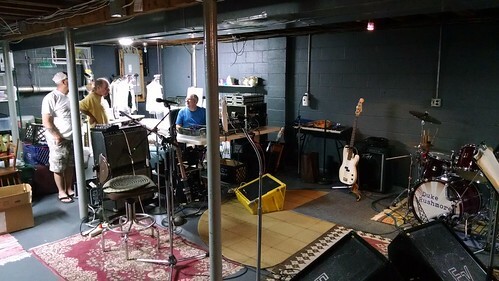 This entry was posted in App Adventure, Apps, Duke Rushmore Band, Making Learning Connected MOOC. Bookmark the permalink.